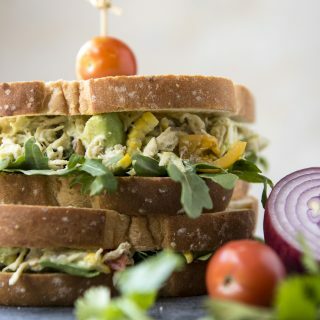 This lightened-up, no mayo Summer Avocado Chicken Salad Sandwich is all you’re going to want to eat during those hot months! Shredded chicken breast, grilled corn, red onion, heirloom tomatoes, and cilantro are all mixed up in a mashed avocado, lime, and Greek yogurt base. This post is sponsored by Pepperidge Farm. All opinions stated are my own. Thank you for supporting the brands that make this blog possible! What comes to mind when you think chicken salad? Heavy mayonnaise. Pickle relish. Soggy bread. Yuck. No wonder most kids don’t like salad sandwiches of any kind. 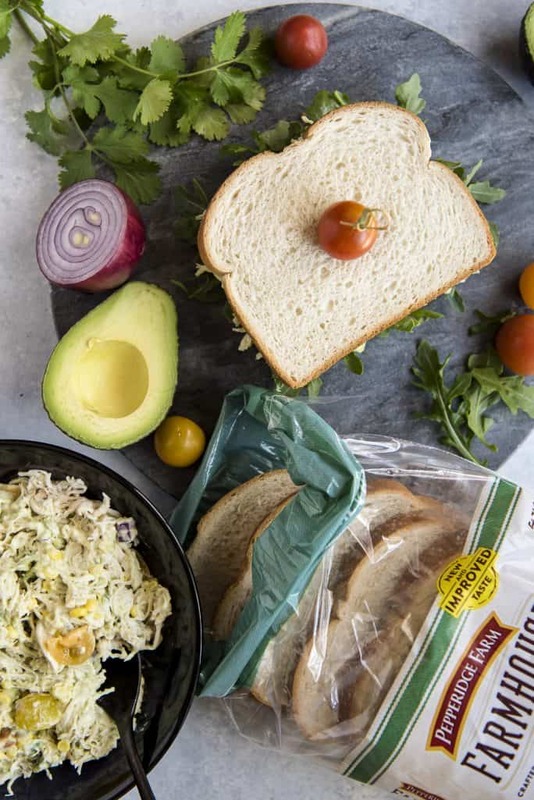 I’m here to introduce you to the best chicken salad sandwich recipe I’ve ever eaten. It’s light, it’s flavorful, and it’s full of some of the best flavors of summer! This is one sandwich you’ll be making on repeat in your kitchen for the next few months. The prep is super simple, and will make you love a certain small kitchen appliance even more! 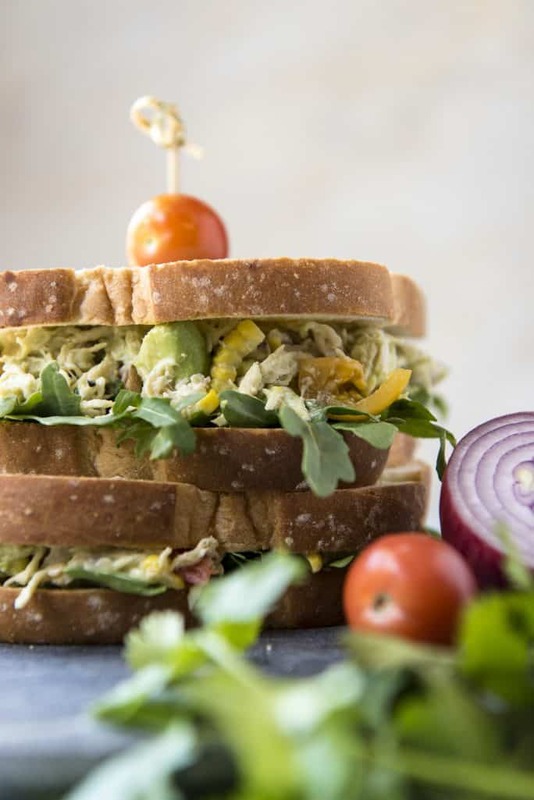 Summer Avocado Chicken Salad Sandwich. • Simple, and made with as few ingredients as possible. The less time spent in the kitchen means more time with your loved ones doing all the fun things. • Fresh. Summer produce is one of the best things about the season, and the more fruits and veggies you can work into your recipes, the better. • Portable. Picnics, BBQs, and road trips are all a big part of summer vacations. Meals that are easy to travel with are a fantastic way to eat well and save money. • Bonus points for anything that needs to be cooked if it can be prepared outside of the oven or stove. Grills, slow cookers, and electric pressure cookers can do the job with much less indoor heat generated. Your electric bill will thank you. 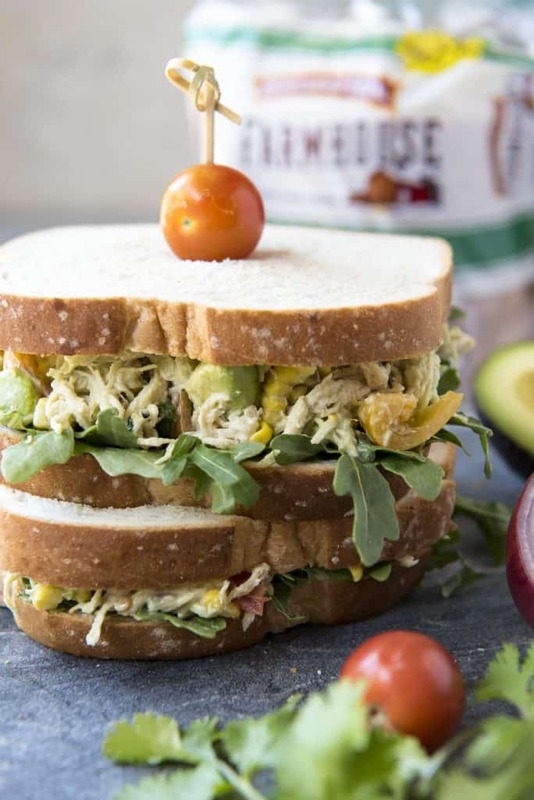 This Avocado Chicken Salad Sandwich recipe fits every single bullet point of criteria! And for you beach body folks (not meeeee), you can rest easy knowing that the chicken salad itself is pretty darn good for you, too. The mayo has been swapped for a blend of Greek yogurt and heart-healthy avocado, giving you that creamy consistency chicken salad needs, but none of the saturated fat. 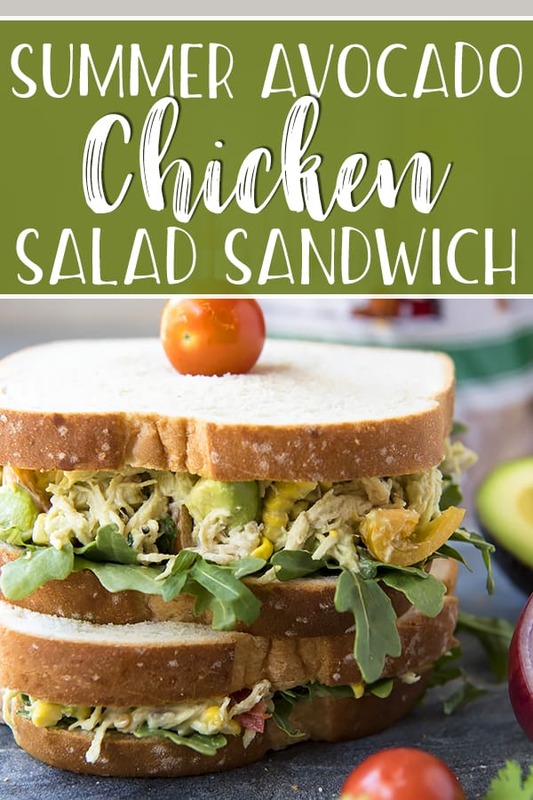 This chicken salad can be eaten in many ways, but my personal favorite is a bit old fashioned – on a couple of slices of white sandwich bread. We are huge fans of Pepperidge Farm. products in our house, from their bread and rolls to their puff pastry. While shopping for this recipe, I spotted the “New and Improved Taste” stamp on Abe’s favorite Pepperidge Farm Farmhouse® Hearty White Bread. I knew the thick-sliced bread would hold up perfectly against the heavy-on-the-chicken salad I was making. What I wasn’t expecting upon my first bite was the new softer texture. The thought of toasting the bread for the sandwiches crossed my mind at first, but I’m so glad I left it alone. The snap of the grilled corn kernels and the pop of the heirloom tomatoes were all the texture that this sandwich needed. Pepperidge Farm Farmhouse® is only available in select locations. Stop by the Pepperidge Farm® website and check the “Where to Buy” link in the top right corner to find a store near you. The good news is, the answer is anything and everything! Celery, apples, grapes, and tree nuts are pretty traditional additions. 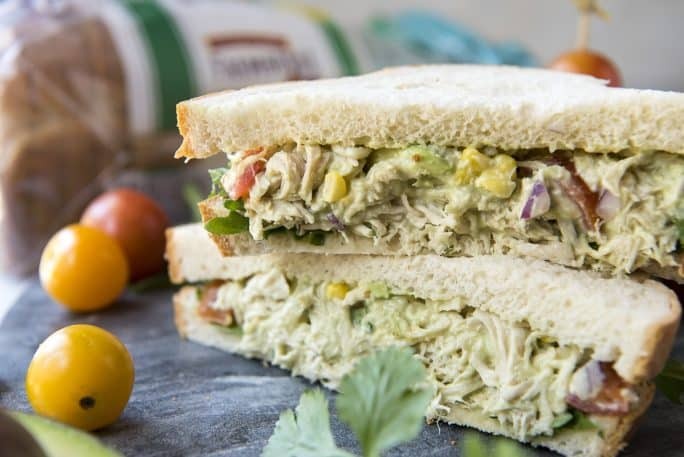 This chicken salad recipe is summer-specific, meaning it includes veggies that are at their peak in the warmer months. If you can’t have corn or hate tomatoes, feel free to sub in sweet peppers and cucumbers instead. Arugula not your favorite? Romaine, spinach, chard, or butter lettuce will add a nice crunch – with considerably less pepper. Are you one of those people who taste soap in cilantro? Go with parsley for a more subdued hint of herb, or try basil or dill if you like lots of flavor. As far as seasonings go, salt and pepper are pretty much required, but you can experiment to your heart’s desire otherwise. Onion powder, red pepper flakes, adobo, cumin…even dried ranch dressing mix would add a yummy taste twist! 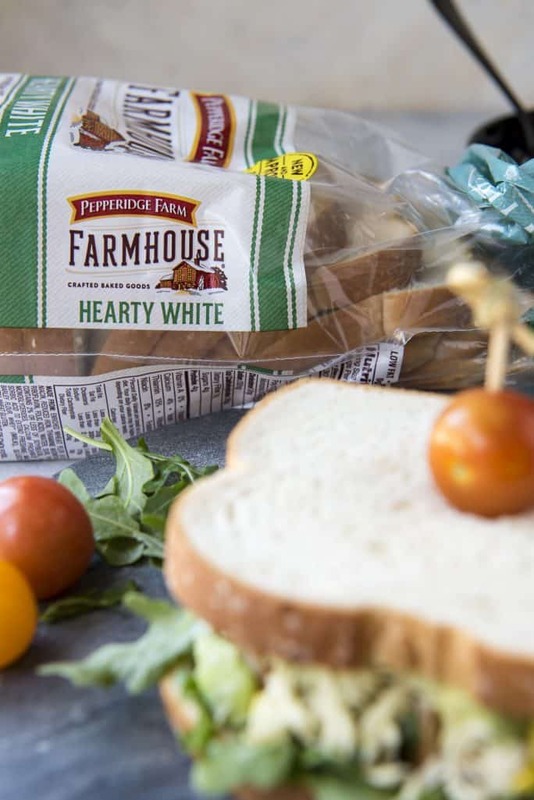 Grab $1.00 off coupon and try the new improved Farmhouse Hearty White Bread today! Looking for easy lunch recipe ideas? Visit the Pepperidge Farm® website for even more delicious sandwiches, and be sure to try these as well! 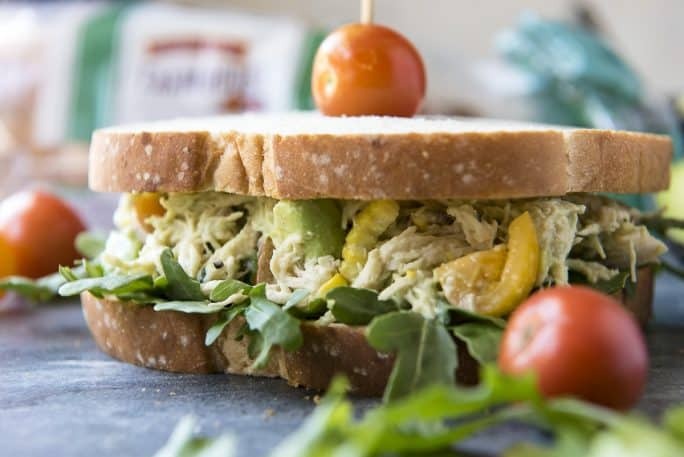 This lightened-up, no mayo Summer Avocado Chicken Salad Sandwich is all you're going to want to eat during those hot months! Shredded chicken breast, grilled corn, red onion, heirloom tomatoes, and cilantro are all mixed up in a mashed avocado, lime, and Greek yogurt base. Season the chicken breasts with salt and pepper as desired. Add the chicken and 1 cup of water to an electric pressure cooker, lock the lid, and set the valve to "sealing". Set the timer for 15 minutes. When the chicken is finished cooking, allow a 5-minute natural release, then carefully flip the valve to "venting" to release the remaining pressure. Cancel the Keep Warm cycle. After the pin drops, carefully remove the lid and let the steam out. When the inner pot is cool enough to handle, remove it from the cooker. Discard all but 1/2 cup of the remaining liquid, then use two forks or a hand mixer to shred the chicken. In a mixing bowl, gently toss together the chicken, tomato, corn, onion, diced avocado, and cilantro. Set aside. In a small bowl, whisk together the mashed avocado, Greek yogurt, lime juice, and vinegar. Add the garlic powder, salt, and pepper to taste. Add to the chicken salad base and mix gently until fully combined. Refrigerate until ready to serve. To serve, place one slice of bread on a plate. Set baby arugula leaves in a single layer on the slice, then top with 1/4 of the chicken salad mix. Close the sandwich with another layer of bread. If you don't have an electric pressure cooker, grilled, baked, poached, or rotisserie chicken will also work well in this recipe. In a pinch, drained canned chicken can also be used. Don't like cilantro? Fresh parsley, dill, or basil will be just as delicious in this recipe! The arugula can be swapped with spinach, butter lettuce, or romaine. PIN THIS FABULOUS SANDWICH RECIPE IDEA FOR LATER! The ingredients you chose are so up my alley! Heirloom tomatoes and avocado on that thick beautiful bread?! Yes, please! Oh yes ! Summer heat is it on it’s way so this is perfect to have for week dinner ! No sweat ! Thank you !